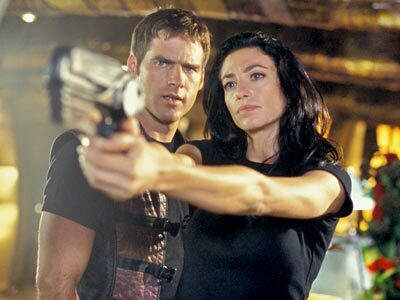 For me Farscape is one of those shows I would elect to have with me if trapped on a deserted island. I can watch it over and over again and have several times. And like all good shows, it got canceled, though it made it a little further than Firefly, Freaks & Geeks, and Pushing Daisies. To give you a little background, Farscape is about an American astronaut named John Crichton whose space pod gets sucked down a wormhole while experimenting with a space travel theory. He encounters new species of aliens, including some who look human but aren’t. Best of all the show is produced by the Jim Henson company, which means puppets and puppet prosthetics are involved. I love the capabilities CGI gives us, but for me alien creatures always look more real if they are actually real. No, Yoda isn’t in Farscape. I’m just using this to point out how glad I am we got the puppets and not the CG monstrosity. The non-traditional yet traditional protagonist. 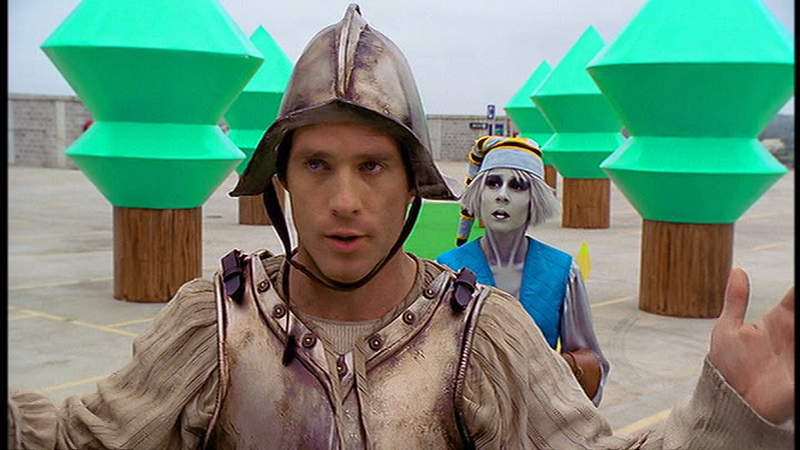 I watched Farscape on the recommendation of several friends and I have to admit, I didn’t connect with John Crichton right away. To me even the actor seemed like a jock cast for a part not meant for him. One of those leading men that says and does everything right, all the while performing impossible feats to save the day. Not so with Ben Browder’s portrayal of Crichton. Though he starts off as a strong and heroic astronaut he soon transforms to bumbling neanderthal in the company of advanced alien races. Astronauts are among the smartest we’ve got in humanity, and he’s stuck barely comprehending the strange, super tech world around him. But he doesn’t remain that way—not exactly. It’s usually thanks to his optimism and refusal to accept there’s no way out of a sticky situation that he and the rest of his companions make it out of situations alive. Something I’ve hated about a certain attitude in certain parts of sci-fi is that our human race is usually portrayed as being far less advanced than any other alien society in every way—as though ours would be the only race in the universe to make mistakes or get it wrong. And though he’s among aliens with advanced technology, many of their ideals or thoughts about how life should be seem incredibly antiquated standing next to Crichton’s morality and integrity. They learn as much from this human creature, if not more so than the human creature learns from them. One more thing I admire about Crichton is how he’s able to maintain his masculinity despite his love interest being Commando Jane. This love interest, Aeryn, could obliterate him in hand-to-hand combat, she’s a far better warrior, and yet Crichton is able to bring out her femininity without making her look inferior and without seeming inferior himself. She’s also one of my favorite characters and I think in some ways a role model as a powerful woman. A great villain should have a good back story and a clear objective. We may not know all of those things in the beginning of our introduction to said great villains, but when they have it, it will show in our storytelling. Now without further ado, let me introduce you to Scorpius. The design for him was genius. Upon first glance you know he’s something human, but not, and you wonder how he came into the state in which you’ve met him. Obviously he looks like a villain, which the creators smartly counterbalanced by having the actor use a softer, gentler voice. It’s the kind of voice you’d expect connected to a kind man, not a hideous villain. In fact it isn’t until the third season that you get any real idea of what’s motivating Scorpius to hunt Crichton so relentlessly. Yes, there are some basic bad guy excuses on the surface that tide us over in the meantime, but the real meat of it lays carefully tucked underneath for us to discover. And also in the meantime, Scorpius shows his “ends justify the means” mentality in his cruelty and murderous actions. But at time goes on he morphs into a villain we empathize with, despite knowing all the evil things he has done and will continue to do. He also messes with Crichton’s head, both literally and figuratively, slowly decaying Crichton’s resistance to his desires. At times we almost want Crichton to give into him. This is why he easily wins my vote for one of the greatest villains of our time. Something I love about sci-fi shows is they usually aren’t afraid to push the limit. Love or hate Star Trek, the old series did some fairly outlandish things in their time, coming up with strange new worlds and civilizations. Farscape certainly took its own creative liberties, and what came from it was excellent story-telling. 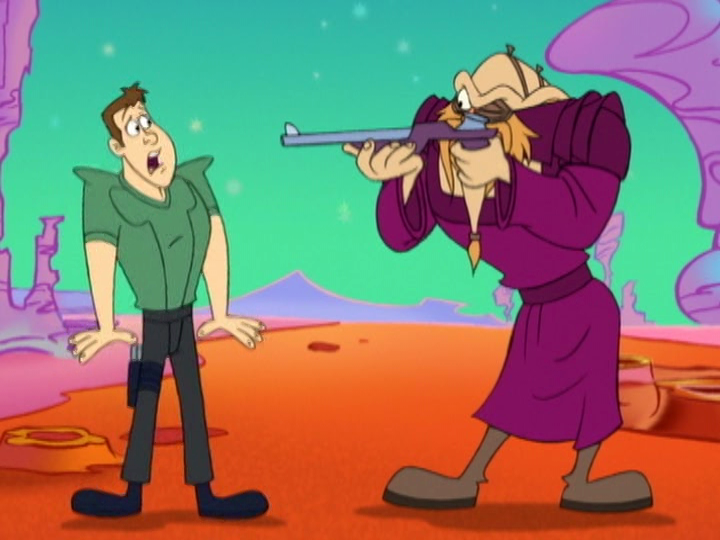 Farscape goes Chuck Jones on us. John constantly makes pop culture references none of his companions understand, which are essentially little asides for us. The writers, in doing that, have built a bridge between our world and this strange new alien world so that in case we weren’t connecting we’re connected now. 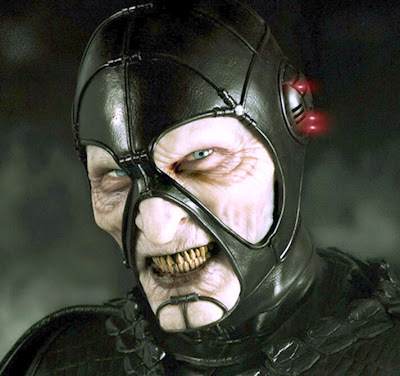 And going back to Scorpius, the writers did a fantastic job in introducing him as well. Scorpius we don’t meet until the end of season one, all the while believing the villain is a vengeance-obsessed Captain whose brother Crichton accidentally killed in a space crash. Just as the story is climaxing to an ultimate face-down between Crichton and the captain, Scorpius waltzed in and steals the spotlight completely. I love this as a storyteller because instead of throwing the big bad boss villain at Crichton right from the beginning, the writer’s carefully build up the empire around the villains, leading us carefully to fear for Crichton because we more fully understand what he’s facing vs. having the villain simply be a cookie cutter bad guy who wants to kill the hero. In fact, for Crichton, the villains he faces only get perpetually worse, though still a grand symphony to his real nemesis, Scorpius. I really like the idea of the villain messing with the hero’s head, and falling into more gray areas than black and white. Watching the relationship between Scorpius and Crichton certainly gave me new food for thought in this arena. But I also admire all the different characters arcs as they move through each season, whether villain or hero. This show makes their characters real people. I care about what happens to them. And each of them holds their own uniqueness and endearing flaws. We know they’re not perfect, yet we root for them anyway. We even at times root for the villains. That’s some good storytelling. I hope to accomplish the same with my own writing. There’s one thing I love. What about you? Are you going to join in the “things i love” blog post movement? Will you tell us about the things you love in upcoming blog posts of your own? You can ping back to the original post or tag it on Twitter with #thingsilove. If you’re a WordPress blogger you can also use the tag “thing i love” to lead us to your post about what you love. You can do as many or as few posts as you like, but the idea is the more we share what we love the more we can inspire each other. And speaking of some things i love posts, be sure to check out The Misfortune of Knowing‘s post on birdwatching. I guarantee you’ll walk away tempted to go out and do it yourself. I certainly was. I’ve heard a lot of good things about Farscape from some of my friends who have seen it. I’ll have to check it out sometime. And I totally agree that puppet Yoda is way cooler than CGI Yoda. What I loved about Farscape was the look and feel of the show. They did a wonderful job with the sets, costumes, and overall production value. How do you know you’re going to be a great writer? You start wondering how everything you love relates to writing, even your favorite show. Keep going, Jae. I’m sure you’ll have one hell of a ride! You didn’t stay for Scorpius? I’m making my shocked face now! 😉 Ben bothered me at first but now I can’t picture John any other way. I’m loving learning more about my storytelling craft. Though it makes it hard to watch some shows, especially if the ratio of poorly written outweighs decently written. Like Fringe I got fed up with, and Heroes, Dollhouse a little too to be honest. But they all make good learning experiences. All this, yes! Also, the puppets. Those brilliant, Henson puppets! Yep, love the Henson puppets! I never got a chance to watch Farscape, but after this I will put it in my que. I agree that we do sometimes root for villains, and honestly, there are villains we love to hate. As for the things I love, I will definitely start posting in my own blog. Thanks Jae, I enjoyed this. Enter your email address and who knows? All your wildest dreams may come true!